There are six main desert regions in South America, the Atacama, La Guajira Desert, Monte Desert, Patagonian Desert, Peruvian Desert and the Sechura Desert. These regions are extremely dry and only get occasional rains. Plants in these regions have adapted to draw as much water as they can from the little rain they receive and store it in their stems and roots. 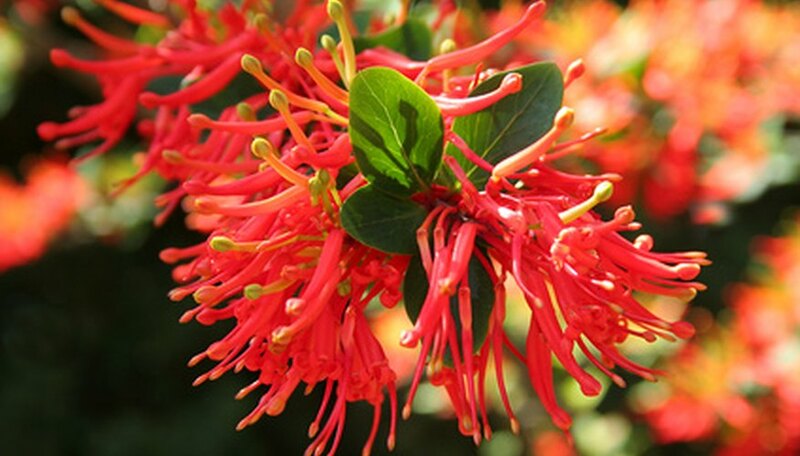 The Patagonian fire bush (Embothrium coccineum) is also called the Chilean fire bush. It is a perennial shrub that can grow over 30 feet tall. The flowers are small and orange to bright red, which is how the flower got its name. When it blooms in the spring, it looks like it is on fire. The plant cannot survive extreme cold and the leaves will become damaged when temperatures drop below 44 degrees F. The fire bush prefers full sun to partial shade and dry soil. The night-blooming cereus (Hylocereus undatus) is also referred to as the queen of the night. It is a night-blooming cactus with a scented, white to yellow flower that can frequently be found in the South American deserts. The flowers bloom only one or two nights a year, usually around the end of May or early June. It prefers to grow in the shade of desert shrubs. The plant produces a large tuber underground that is often eaten. The desert sand verbena (Abronia villosa) is a small, deciduous annual. It grows up to 4 inches tall and 20 inches wide. The leaves are thick and gray in color and the flowers are lavender and grow in clusters. The plant prefers full sunlight and needs little water to grow. The desert sand verbena likes sandy, well-drained soils. The flowers make an excellent ground cover and spread quickly after it rains. Amancaes (Ismene amancaes) are herbaceous annuals. It is native to the coastal hill of Peru. The flowers bloom in late summer to early fall and are yellow with a green center that only last two to three days. The plant prefers moist, sandy soil and full sunlight. The blooms appear before the leaves of the plant. In the winter, the plant remains dormant and can survive well in a cool, dry climate.